The STI clinic is a free, walk-in sexual health service offering screening and treatment for STI's/STD's including, Chlamydia, Gonorrhea, Syphilis, Herpes, Genital Warts, HIV (including PEP) and many more. The HIV clinic provides care and treatment for people who have been diagnosed with HIV. Care is provided by a multidisciplinary team of Doctors, Nurses, Medical Social Workers, Phlebotomists, Pharmacists and Health Advisors. If you are attending the clinic and have flu symptoms please report this to Reception immediately on arrival. Our walk-in STI clinics are on Monday AM, Tues PM and Thurs PM. Please see our 'Coming to see us' page for ticket allocation and further information. All other clinics are by appointment only. We are offering a very quick and easy self-taken STI screen. If just want a 'check up' this option may be suitable for you. Please click here for further details. 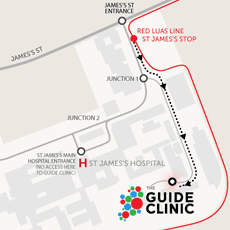 The GUIDE Clinic, Dublin, is the largest, free STI, HIV and Infectious Disease service in Ireland. Our mission is to provide an excellent service to patients with HIV, Sexually Transmitted Infections (STI) and Infectious Diseases, including International Health. We are a highly trained team of specialists committed to ongoing research, teaching, continuous development and improvement of our service.